Hatch Live is a live design competition kicking off in NYC this October, with submissions closing soon. The Grand Prize winner will receive $4,000 and a brunch and portfolio review for former Editor in Chief of Surface Magazine, Dan Rubinstein. 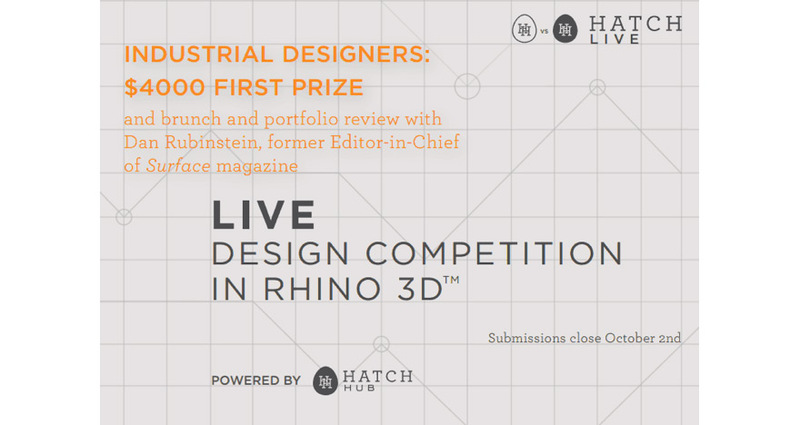 Hatch Live is a new and fast-paced design competition allowing product designers to showcase their talent. 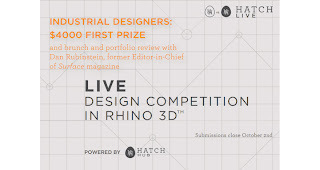 Bringing together the design community and an audience of design lovers, Hatch Live will take up-and-coming industrial designers and place them head-to-head in a live design battle using Rhino 3D software. Competitors will receive instructions to create an exciting new product within a specific product category, limited to specific bounding shape constraints set for each round. Up to 12 people will be selected to compete live in the competition matches. Learn more and sign up to compete now at www.hatchlive.com.